Kisscount is a personal accounting software aimed to be as simple as possible and offers only necessary features to quick edit and view your accounts. This documentation will show you what it's possible to do with KissCount. 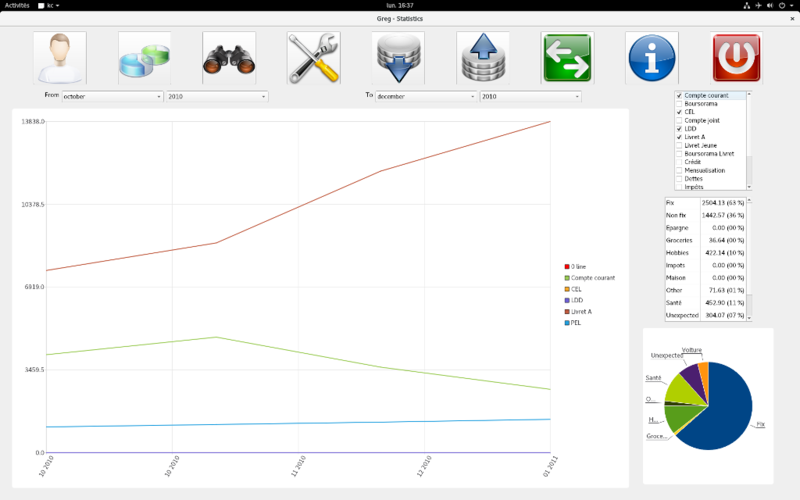 To run the software, you need to install Qt5, libqt5sql-sqlite, libqt5charts5 and libofx (except for Windows). Now you may go to "Preferences" tab to custom your accounts and categories. 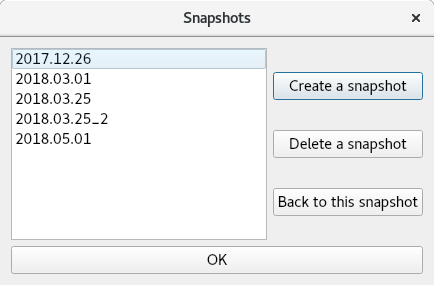 This panel is the home for all common operations (the goal is to do not have multiple windows). On the upper left there is years/months list. At the beginning of each month you have to "generate" a new month. By right-clicking on the list, a contextual menu will appears letting you generate or delete a month. Generate a month means to report all fix operations and accounts values to a new month (it's possible to do not report any operations if no start month is selected). On the upper middle, all your accounts with start value, end value and current value (which correspond to the date selected into the calendar, this is the current date, last day if you're on next month, first day if the month is in the future). 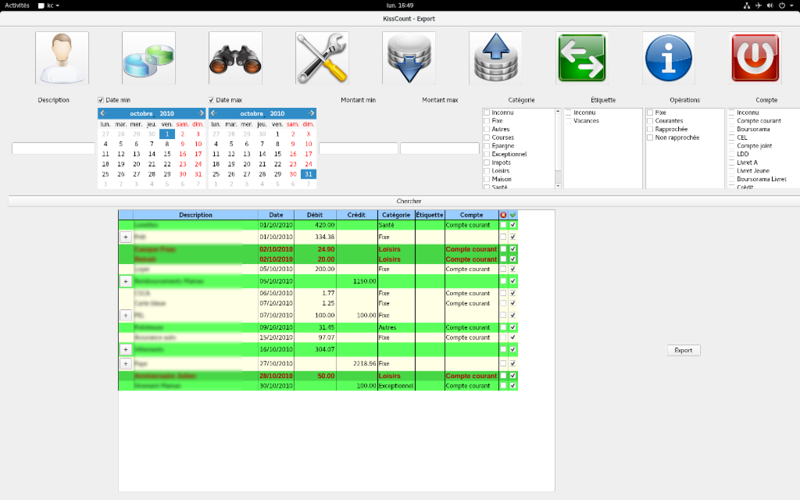 Initial values and calendar date are editable. Modifying an initial account value will not modify previous or next month values. The star beside account number indicates that the account is shared. On the right there are statistics. Balance is : total credit - total debit. These values are updated when an operation is modified. For categories computation, only debit operations (without transferts) are taken in account. The middle part is the most interesting one. On the upper (in yellow), there are "fix" operations, it means recurrent operations that you have each months (remuneration, rent ...). In green are others operations of the current month. Each week is automatically separated by a black line. To delete an operation just check the case with red cross. Operation edition is like in a spreadsheet, copy-paste and undo/redo are not implemented. If you type an operation that have the same description as an other one registered until 3 months, account and category will be automatically filled. You can group a set of operations into one (operations with a "+" in front). To do that, you have to select cells with "control" (ctrl) key pressed and click on "Group" button. You can also add an operation to an existing group by selecting "root" operation or a sub-operation of the group and another operation. But you can't group operations already grouped or group fix and non fix operations. It's possible to enter a mathematical formula instead of a numeric value into "debit" and "credit" cells. You simply have to start description with "=". Supported operators are +, -, *, / and brackets. Example : "=-3+5*(4/2)"
Two operations with opposite amounts (debit of 100 and credit of 100 for instance) and with the same description and different accounts are considered as a "transfert". They are not included into statistics, except if one account is blocked, in this case, it's considered as a debit. In this mode, all operations are taken in account. Its activated by default. In this mode, operations from/to virtual accounts are not taken in account. Check mode allows you to do a check between your bank account and operations registered into KissCount, you can activate it by checking "check mode" in the lower left square. In this mode only checked operations will be taken into account for account current value and final value computation. Values in brackets are current values +/- not checked operations of previous months (like non paid cheque). Sometimes you have to modify operations from past months (add/remove/modify). To avoid to report by hand these modifications there is the "Update next months" button. It will apply the delta between old and new accounts values to the account's amount of the next months. Warning : manually edited account amount will be overwritten by this operation. Statistics panel shows account's values during an interval of time and total of expenses by categories. 0 line (in red) is always displayed. If the two months and years are the same. Statistics will be displayed for selected month. Does a search following some criterias. You can only enter a part of the description if you want. Try to do precise searches if you don't want to have a lot of results. Results are displayed in ascending (or descending) order without distinction between fix/non fix operations and without line separation between each week. Found operations can be edited like in main panel. You can do modifications on all found operations in one click. For instance change category, renames them or change account. Default account is the first account shows into account's listbox when you add an operation. Tags are lightweight categories that are optional ("Holidays" for example). By selecting an account, the user list is updated. An user selected means that the account is shared with him (and account number will be followed by a star). So it's ease to share accounts. Only the account owner can really delete an account and share his account. If you delete a shared account that is not your own, it will only be removed from you accounts list. Blocked accounts are accounts where you can put money but not gets from, like PEL account. For statistics a credit on this account will be a charge. Virtual accounts allows you to virtually save up money. For example, at the begining of the year you can spare state tax. 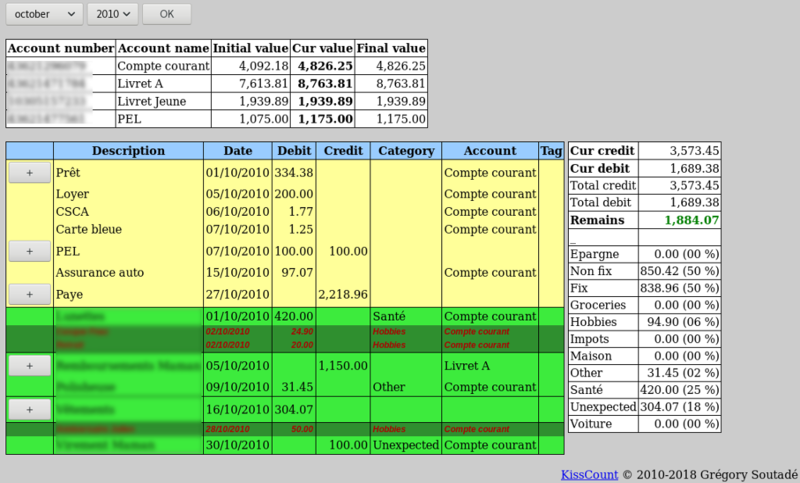 You can ignore theses transferts by going in real mode in the main panel, to have correct accounts values. You can also use it to "save" money for futur taxes. Rather than delete an account and lost tracability, you can hide it. It then won't appears in main panel. You can also hide not usual accounts. 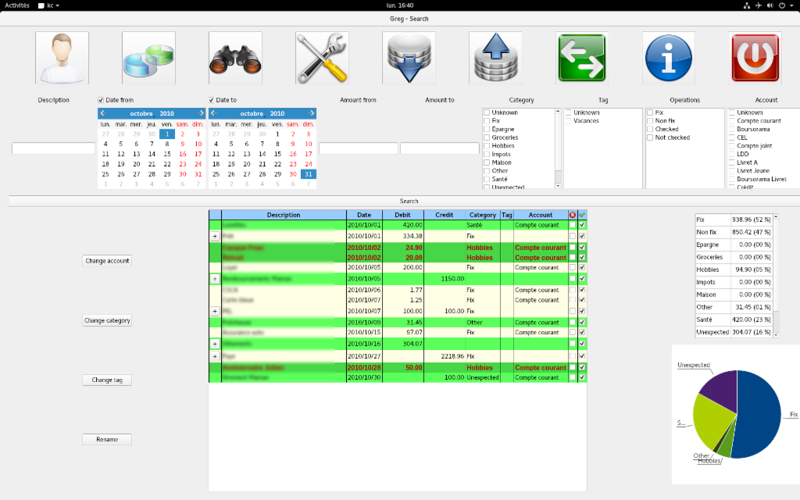 It's now possible to import operations from other accounting softwares. Supported software formats are OFX (not available for Windows), Grisbi (>= 0.6.0 not encrypted) and KissCount (XML). The first step is to load the file with "..." button (or by typing the pathname). If some accounts are not already registered, they'll be displayed in the left array, and you'll have to match them with an internal account (or create new ones). It's the same for categories. The next step is to load (automatically done if there is no unknown accounts/categories) with "Load operations" button. Before definitively import operations, you can suppress or rename them, KissCount can detect renaming patterns and apply them to other operations. If you want to save these patterns (for a next import), you have to check "Save import patterns". Finally you can integrate these new operations with "Integrate operations" button. You can export data in KissCount (XML) format or in CSV format. To export operations, select criterias in export panel and click on "Search" and "Export". Deleted operations are only for export mode, they'll remains in database. A simple PHP page show your accounts online. Only main panel is available (read only) and without statistics. No translation is offered for this page.